Made in the USA and for people of all ages, Peepers transform your hands in to lovable, smiling creatures! Often imitated, never duplicated. These are no cheap imitation. These are the real, the original Peepers Puppets, and the plastics are tested for safety to meet the regulations for CPSIA Certification (certificate available upon request). Winner of puppetry's highest honor, the UNIMA Citation of Excellence, and recipient of three Jim Henson Foundation grants, Hobey Ford is known for excellence in puppetry performance and craft. 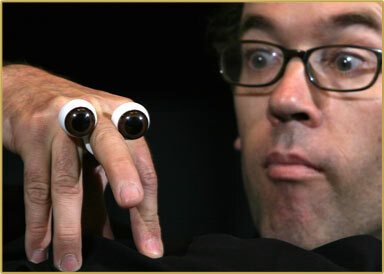 As a puppeteer, Ford has made his own puppets for years, and he cooked up the first Peepers prototypes at home. But the inspiration came from French mime Yves Joli (who Ford says is the first performer credited with using only their hands as a puppet) and the legendary Jim Henson (who used to rehearse The Muppet Show with Ping-Pong balls on his hands as stand-ins for characters such as Kermit the Frog). "It’s sort of an old idea," Ford explains. "Basically, my kids wouldn’t let me wash their hair," he reveals. "My wife said, ‘You’ve got to figure something out,’ because they hated shampoo. So I made these little eyeballs, and they would let the little puppet character wash their hair. So that’s how they came to be." Hobey utilizes his artistic study at The State University of New York at Purchase and the University of North Carolina at Asheville to design and construct all of his Golden Rod Puppets and the beautiful sets that surround them. Hobey also draws on his early experiences growing up in coastal Connecticut or living in a Nevada Native American community in writing the scripts for some of his performances such as "Whale Walker" and "Turtle Island Tales".